It is time again for the best party, Paint Party Friday. A huge thanks to Eva and Kristen for hosting. 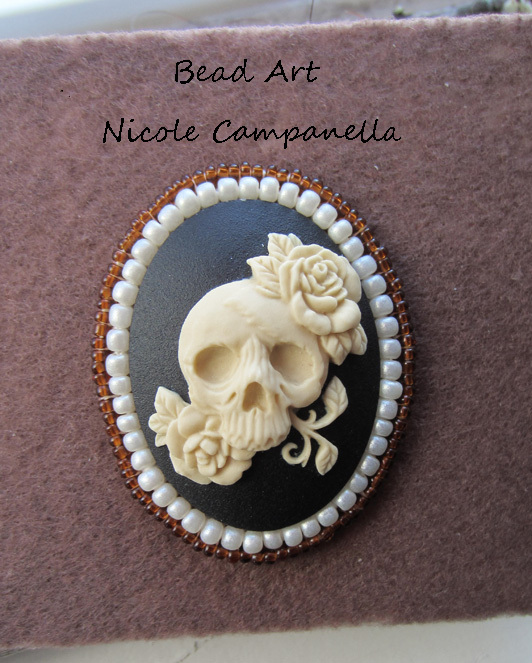 This week I actually drew a face and started a special order bead piece. Plus I got a few more cabs made. They have been selling quite well and I am happy about that. So first the face. 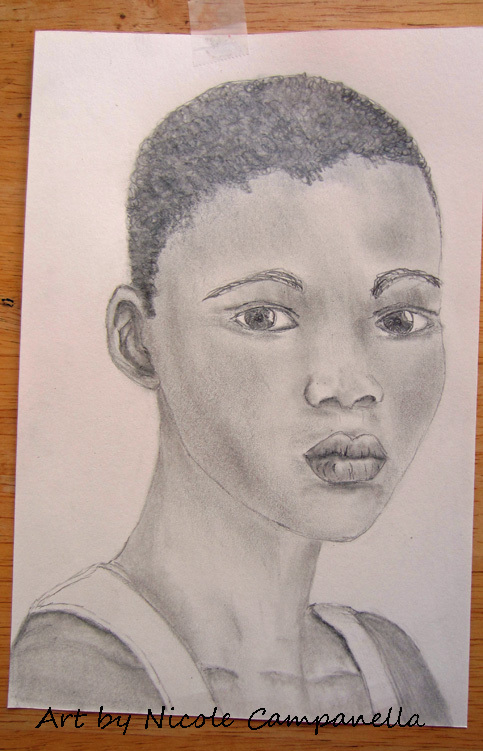 I have not drawn anything for several months and I have really missed it. 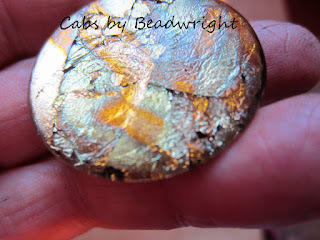 Marbled Gold Leaf Cab. This has so much depth to it. Here is one of my Day of the Dead Cabs. A special order. So far my hands are OK with it. Last but not lease for all of you who live in or near the Florence, OR. 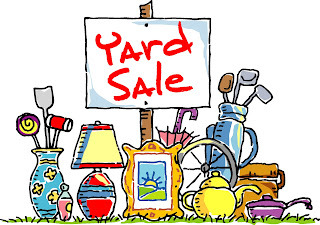 area I will be having a very large yard sale Saturday Sept. 30 and maybe Sunday if the weather holds. If you are interested in stopping by email me for my address EMAIL LOTS AND LOTS OF GOOD ITEMS. BEADS, TOOLS, ELECTRONICS, FURNITURE, VERY NICE CLOTHES, AND MORE.... It all has to go! 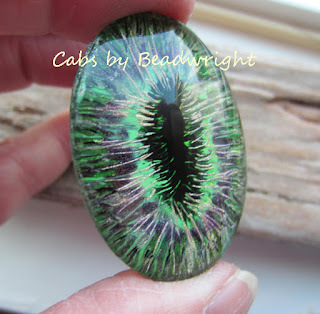 On last thing, when you see my blog how is the font? Large, small or just right? I have been having trouble with it. Beautiful work as always Nicole, good luck with the yard sale! 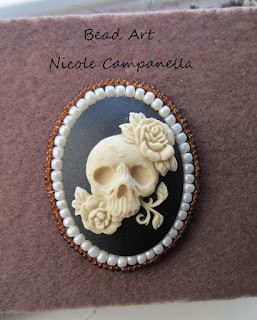 Gorgeous work on all fronts, Nicole! 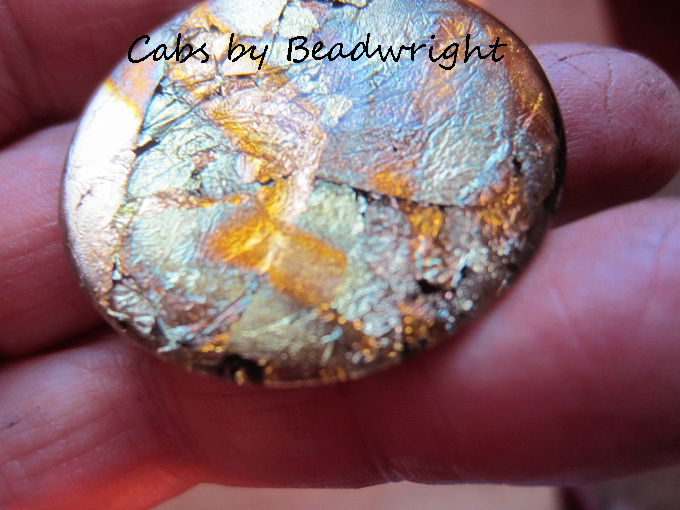 Particularly the cabs, totally in love with the goldleaf one. Great shading on your face which is so expressive. Your drawing is excellent and your cabs are gorgeous; so full of colour. My favourite, however, is the skull with the roses. Beautiful cabs and the portrait is expressive and well drawn. The portrait is fantastic - I love your skills in pencil drawing and your cabs are really unique - one lovelier than the other!The special order is cool! Happy weekend! Love the gold leaf but all the cabs are gorgeous. Good luck on your garage sale, hope the weather stays clear for it. Such gorgeous pieces! And the portrait is wonderful. Love all the art pieces and hope you have great success on your yard sale! The font is good for me, easy to read! What a beautiful drawing and the cabs are gorgeous! The font looks fine to me. I hope your yard sale goes really well. Good luck with the sale. Such gorgeous pieces! Cabs are stunning as is that face...wow you captured so much vulnerability!! All the best on the yard sale!! Your font is really good, white on black is good to read. Your art is really good too! :) lovely colors! Lovely art, your font looks great. Good luck with your yard sale. First off, the font is perfect. I love the drawing. Your ability with faces is outstanding. And your cabs are so gorgeous. Those cabs look amazing! So vivid - enjoying the colors in both of them and your Day of the Dead themed one is stunning - loving the classical feel to it! Gorgeous collection! Your font is perfect for me!! Thank you!! Your art truly amazes me! I love the face! Your cabs are magical! So happy they are selling well! Very soulful portrait and beautiful cabs. Love the red one. Beautiful expressive face! Love your shading. Caps are gorgeous... the green one took my eye for sure!! Happy PPF week! 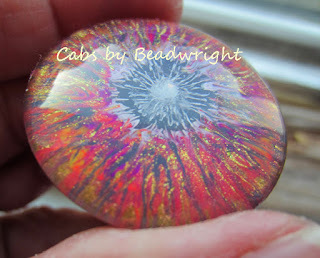 Your cabs are wonderful, such gorgeous colours, and they look like they're great to touch and hold too. The font is quite large, but not too large, easy to read. Hope your yard sale went well!